Hyperhidrosis is excessive sweating. Everyone sweats when they’re hot, exercising, or feeling stress. But people who have hyperhidrosis sweat most of the time and sweat heavily, even without the usual triggers. If you have hyperhidrosis, you may sweat all over your body. Or you may sweat mainly on your hands, feet, armpits, face, and genital area. Your clothes may be soaked with sweat. Your skin may become white and wrinkled, or red and irritated from the moisture. Often, dampness from the sweat is accompanied by odor. Sweat by itself doesn’t usually have an odor. But once it is on your skin, bacteria and other germs begin to break it down. This causes it to smell. Hyperhidrosis can have an unpleasant effect on your life. You may feel awkward and uncomfortable in social situations. You may be self-conscious because of dampness and odor. You may also be afraid to touch or shake hands with people or raise your arm to reach for something. You may feel embarrassed about being in public, spending time with your friends, and going to work or school. These are very normal reactions to having hyperhidrosis. You seem to sweat a lot more than normal. Your sweating doesn’t have a cause, such as exercising or being in hot weather. You also have chest pain, fever, shortness of breath, or the feeling that your heart is pounding. Your sweating mostly happens at night or worsens at night. There are 2 types of hyperhidrosis. Primary hyperhidrosis (also called focal hyperhidrosis) tends to affect both sides of the body. It occurs on the feet, hands, underarms, head, and face. Sometimes, it affects larger areas of the body. It seems to run in families, often begins in childhood, and occurs during waking hours. It is usually very hard to determine the cause of primary hyperhidrosis. Hormonal changes (such as menopause). Problems with blood sugar control. Certain infections or other conditions. Certain medicines, such as aspirin, some blood pressure medicines, and antidepressants. Your doctor will probably ask you questions about your symptoms and medical history. The signs of hyperhidrosis may be obvious to your doctor and no testing may be needed. You may also be checked for other problems that could be causing your symptoms. For example, your doctor may order urine and blood tests to check for conditions such as an overactive thyroid or low blood sugar. If your doctor suggests tests specifically for hyperhidrosis, the tests simply measure the level of moisture on your skin. Can hyperhidrosis be prevented or avoided? You cannot prevent primary hyperhidrosis. And often, you can’t prevent secondary hyperhidrosis, either. It depends on what is causing your symptoms. If your symptoms are caused by blood pressure medicine, it may be possible to change medicines. If your symptoms are caused by caffeine, they may go away when you stop drinking caffeinated drinks. But if your symptoms are caused by heart disease or cancer, it may be impossible to prevent hyperhidrosis. Antiperspirants. If regular antiperspirants haven’t helped, you may try a product with a higher level of aluminum chloride hexahydrate (brand names: Certain Dri, Drysol, Hypercare, Xerac). This is the ingredient in antiperspirant that shuts down sweat ducts. You may try a product from the store or you may talk to your doctor about a prescription. You’ll apply these antiperspirants at night to towel-dried skin several times a week. Your doctor may suggest you apply it every night or even twice a day for the first week. After that, you’ll apply it once or twice a week to help keep your sweating under control. Prescription medicines for hyperhidrosis. Your doctor may prescribe medicine to help stop stimulation of the sweat glands. This medicine may have side effects such as dry mouth, constipation,and blurry vision. Taking it over time may lead to more serious problems. Talk to your doctor to see if this medicine might be useful to you. Medicine to treat the cause of secondary hyperhidrosis. If you have secondary hyperhidrosis that is caused by another condition, medicine that treats that condition may help control your sweating. For example, if stress is part of what triggers you to sweat heavily, then medicine to treat anxiety may be useful to you. Iontophoresis. This treatment option involves using a special machine that applies low amounts of electricity to shut off the sweat glands. This treatment generally is used for hands and feet. Botulinum toxin type A (brand name: Botox). This treatment is typically injected into the armpits to block the nerves that cause sweating. Botulinum toxin can work well, but can be expensive and painful. Also, it sometimes causes flu-like symptoms. Each treatment is effective for about 4 to 8 months. Surgery. If your hyperhidrosis is severe and other treatments haven’t worked, surgery may be an option. A surgeon may remove or cut nerves that activate certain sweat glands. Or he or she may remove some sweat glands completely. Typically, surgery is used only as a last resort. Many people who go through surgery have new or worsened sweating (called compensatory sweating) later in life. Surgery also carries the risk of nerve and artery damage. A number of things can help you deal with hyperhidrosis day to day. If you are bothered by odor, try bathing daily with antibacterial soap. This will help wash away the bacteria and other germs that gather on the skin, which are what can cause odor when you sweat. Be sure to dry yourself completely. Bacteria and other germs thrive in damp areas. Be sure to let your shoes dry completely before wearing them again. Do not wear the same pair of shoes 2 days in a row. Wear cotton socks or socks that pull moisture away from the skin. Change your socks throughout the day if needed. Cotton and other natural fibers may help you feel cooler and give you the sense that your skin can breathe. But when you exercise, special fabrics designed to pull dampness away from your skin might be most comfortable. Dress shields are pads that you can place under your arms. They may be useful and help you feel more confident that you won’t sweat through your shirt or blouse. Some people find that keeping an extra shirt or pair of socks on hand helps them feel more secure about being in public. Doing this gives you the option to change if your clothes become damp and you feel uncomfortable. Keep up with your laundry. Be sure to wash and dry clothing thoroughly before wearing again. Try shaving in bothersome areas, such as under the arms. If certain foods or drinks seem to make your sweating worse, avoid them. This might include caffeine, spicy foods, and alcohol. Relaxation techniques might be helpful (such as yoga and meditation), especially if your sweating is triggered by stress. Even if the sweating isn’t triggered directly by stress, the sweating itself can cause stress, so relaxation techniques can be helpful. What is the likely cause of my hyperhidrosis? I’m embarrassed by how much I sweat. Will a prescription antiperspirant help? What is the best treatment option for me? Will I need to take medicine? 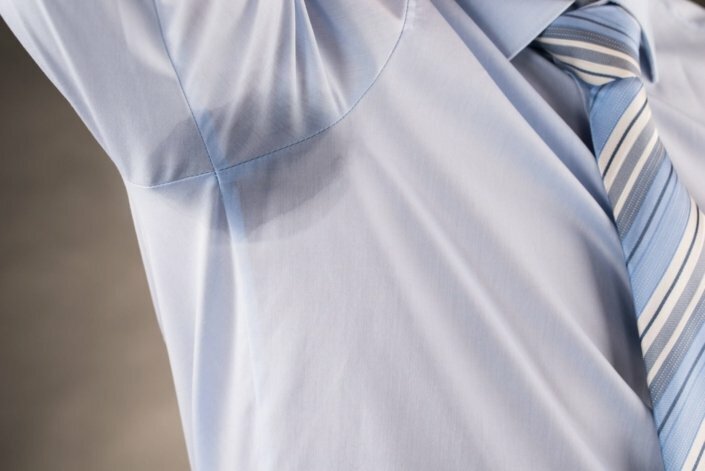 Is hyperhidrosis a sign of a more serious health problem?